Farm Girl Pink....: ~ Melmac - Lot's of pink... and a splash of yellow! 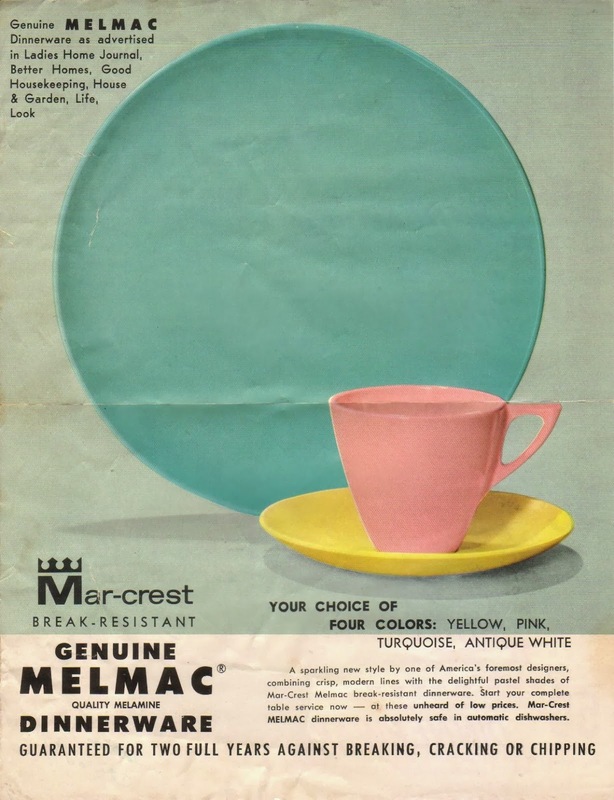 ~ Melmac - Lot's of pink... and a splash of yellow! I have such a soft spot for Melmac. I love the durability of it. And that it still holds on to its color no matter how many times it goes through the dishwasher. 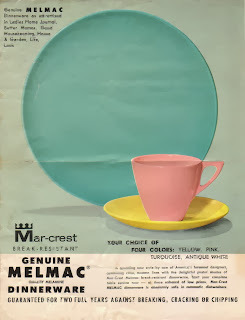 Now I have been attempting to pick up more of the solid pink Melmac pieces. I have only come up with a few bowls. But they have been good finds for me. These odd little pink bowls actually match a set of plates that I have had forever... these are from the Lucent line of dishes. These are my favorite plates to use for cakes. If I am taking a cake to a party... it is going on one of these plates. These were not exactly Melmac. They were made by Lucent and the pattern is Morning Song. And have a slight difference in the quality of plastic. The Lucent bowls actually have the ability to let light filter through them. These lovely pink plates with the white birds and tree branches... were designed by Roger Lowery in the 1950's. This pattern also came in a gorgeous pale turquoise. And their pattern name was Evening Song. Now these are typical Melmac pieces. I have added smaller pink bowls and the cereal size yellow bowls to the cabinets. The pink bowls are slightly smaller. But handy to have. They are perfect for pudding. I can recall picking up this set of pink for like a dollar. It was all tossed in a brown paper sack. Looking all lonely. And it got snapped up, by me! It was filled with plates, platters, coffee cups and the servers. I love it all. Yet, I have yet to bring home any turquoise Melmac. Just have not found any on my odd adventures when I am in the mood to buy it. pink goodness at ~Pink Saturdays!